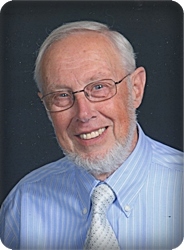 George A. Pott, age 79, of Cutlerville, went to his heavenly home on Wednesday, September 5, 2018, and is now face to face with Christ his Savior. George will be lovingly remembered by his wife of almost 58 years, Elsie; children, Jim and Robin Pott, Anita and Bill Simons, Denise and James Jones, Greg Pott, Rick and Anne Pott, Vikki Pott; grandchildren, Michael Pott, Steve and Alyssa, Scott and Kristen, Nick and Jess, Tyler, Blake and Cayla Simons; Crystal, Chyesha, Julia, Kelsi, Karli, Arianna Jones; Stephanie, Jordyn Pott; Brennan, Bryan Pott; nine great grandchildren who called him Opa; brother and sister, Rev. Frank and Betty Pott, Meg and Oscar Barrios; sisters-in-law, and brothers-in-law, Fran and Fred Hekstra, Henny and Bill VanEgmond, Ina and Brian Matz, Marianne and Don Morell, Tom Slendebroek, Rika Slendebroek; and many nieces and nephews. He was preceded in death by his parents, Rev. Jerry and Ada Pott; sister, Marguerite; brother, Eugene and Kitty Pott, parents-in-law, Marten and Ann Slendebroek; brothers-in-law and sisters-in-law, Al Slendebroek, Bill and Genny Slendebroek, Simon VanderVeen, Grace Kooiman, and Bob Raredon. After high school, George enjoyed leading Bible lessons with Mexican migrants. He retired from Keeler Brass after 40 years of service. In retirement, George worked for Bio-Chem for 18 years. He loved bowling and fishing. George and Elsie loved their trips to Hawaii, the Netherlands, Argentina, the Tiger Cruise with his son, Rick in the Navy, to Zion and Bryce National Parks, and many day trips to Shipshewana. The family will greet visitors on Sunday, September 9, from 2 - 4 and 6 - 8 at Stroo Funeral Home and Monday, September 10, from 10 - 10 :45 am at Cutlerville East Christian Reformed Church (501 68th St. SE), where the funeral service will be held at 11 am, with Rev. James Jones and Rev. Frank Pott officiating. Interment in Blain Cemetery. Contributions in memory of George may be made to Cutlerville East CRC or World Vision. We are so sorry to hear of your loss and extend our sympathy, love, and prayers to you and your family. I’m so sorry for your loss. This is one of life’s greatest challenges that we have to face. Jesus said ,did and promised something that gives us comfort and hope. In the Bible at John 11:11-14 Jesus liken death to sleep. This comfort us in two ways: 1) we are assured by those words that our loved ones are not suffering or in pain. 2) If a person is just sleeping he will wake up! Notice what Jesus does next at John 11:43-44, this is amazing!